Russell G. Jones has worked for over a decade as facilitator, moderator and as a teaching artist creating programming, workshops and curriculum for Artsgenesis, the ABC+ Program, Developing Artist Theater Company, The National Black Theater, Community Word Project, Labyrinth Theater Company, Periwinkle National Theatre, The Liberty Partnerships Program at Bank Street Teachers College, Bronx Academy of Letters and The Cleveland Public Theater. 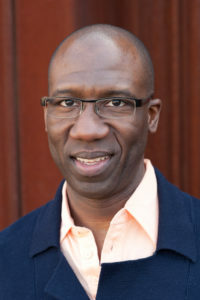 Russell has been a member of The Labyrinth Theater Co. since 1995 where he has taught in the Master Class, Ensemble Workshop and Intensive Ensemble. He was the Program Coordinator for the 2014 Intensive Ensemble and currently serves on the Board of Directors. As a stage director he has worked at Intar (GOOD GRIEF), The Pure Pop Festival (THE MALTESE CHICKEN), The Cleveland Public Theater (CHANGE 4 A DOLLAR), Mass Transit Street Theater (LESSONS), and Harlem School for The Arts (UNDERCOVER ON ANOTHER DAY OF ABSENCE). He can be seen on stage, film and television and is an Auldeco, Obie and SAG Award winning actor.